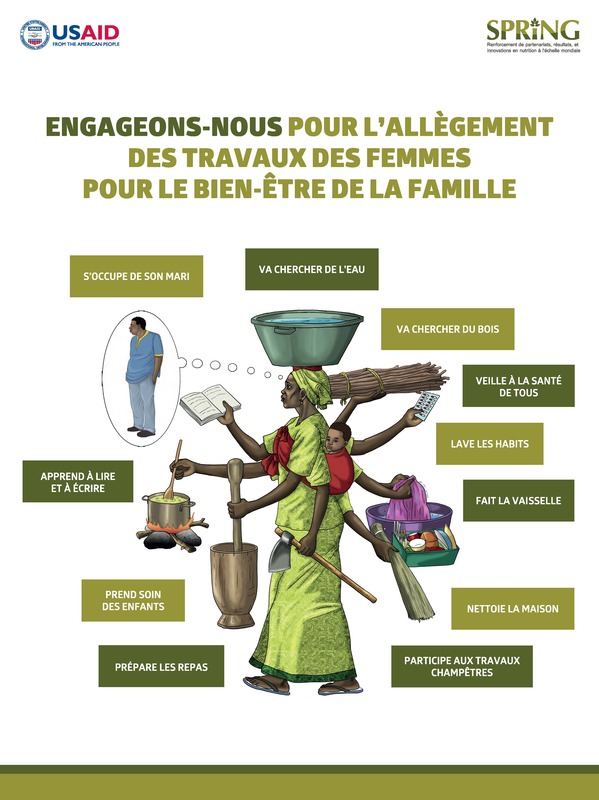 This SPRING/Senegal graphic illustrates a woman's numerous responsibilities in ensuring her family's health and good nutrition, and encourages sharing the workload between men and women to improve the household's well-being. It was developed for the Senegal Training Manual on Gender and Nutrition, which emphasizes men’s involvement in the management of household nutrition and health, encourages women’s participation in household decision-making, and promotes equal sharing of nutrition-sensitive tasks. Promoting gender equality in Senegal is vital, given 22 percent of women of childbearing age nationally suffer from chronic energy deficit (17 percent of women in Fatick region, 22 percent of women in Kaolack region, and 26 percent of women in Kaffrine region) (SMART survey, 2015).